Our Stockholm office is one of IYC’s 14 strategically located offices in the world’s most prominent yachting destinations. The office was opened in response to a growing interest in the yachting lifestyle from this part of the world and a local presence in Stockholm will help educate and give a personalized service to our clients living up North but looking to charter Worldwide. 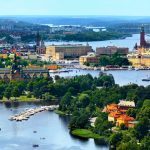 As well as serving the local client base for charters in all of our destinations, the IYC Stockholm team will also be delighted to offer expert advice to anyone looking to visit this beautiful part of the world. Our services to yacht owners include yacht management, charter management, marketing agency services, crew management, and new build consultation. In everything we do, our approach puts intelligent decision-making at your fingertips. It’s your choice. Get in touch and we’ll help you make the right one.